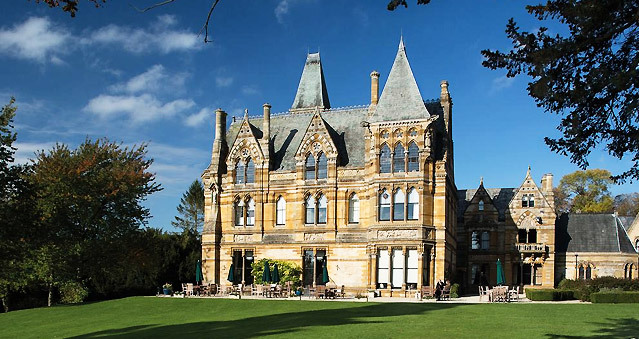 Ettington Park Hotel has towering turrets, colourful brickwork and classic arched windows. The river Stour weaves its way through the estate. Ettington Park Hotel, the only AA 4 Red Star hotel in Stratford-Upon-Avon, is set in 40 acres of parkland in a verdant valley with the River Stour meandering through it. Ideal for: The Killing, the Bake Off, iPad movie making, Indoor Crystal Challenge, Awakening the Dead, Around the World, Cosmos & Cocktails, Stocks in the City, Real Life Clu d’oo, Laser Clay Pigeon Shooting, Crime and Dine, Murder Mystery and Christmas Events!